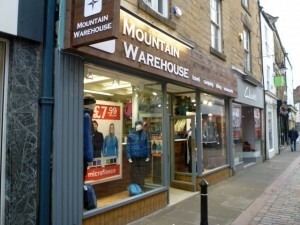 Hexham’s Millets store in Fore Street is to close on 21 September, after trading in the town for seven years. Though the Hexham Courant broke the news of the store’s expected closure three weeks ago, the retailer’s owner, JD Sports, had “refused to comment on a timescale”. However, when I visited the store on Saturday (25 August), a staff member was able to confirm that the store was closing, and that Friday 21 September would be its last day. While there are, as yet, no ‘closing down’ posters in the windows, the empty shelves and sparser-than-usual interior make the store’s fate fairly obvious to anyone who visits as regularly as I do. For the shop’s friendly and helpful staff – who I have nothing but praise for – its closure must be a very difficult time. Having survived the store cull following Blacks’ 2009 Company Voluntary Arrangement (CVA) and then its administration earlier this year, it must be a bitter pill to see your branch closed after the business has supposedly been saved. Hexham’s Millets is seemingly not alone, however: only last month, The Independent reported that JD had shed about 100 Blacks and Millets shops in the six months since it had purchased the ailing chain. While JD deserves credit for rescuing the business in the first place, and for taking decisive action in a bid to restore its profitability, the future size and shape of the Blacks business remains uncertain. The scale of the slimmed-down chain – now at fewer than 200 stores compared to a peak of over 550 in 2002 – isn’t necessarily an issue given the scope for buying and administrative synergies with JD’s other businesses, but it’s easy to see Blacks soon being overtaken by the 150-strong (and growing) Mountain Warehouse as the UK’s most prominent outdoor retailer. Personally, I prefer the quality and fit of Millets’ Peter Storm clothing over Mountain Warehouse’s Mountainlife brand, but you do have to wonder whether the latter’s arrival in Fore Street in December 2010 has taken trade away from its competitor. 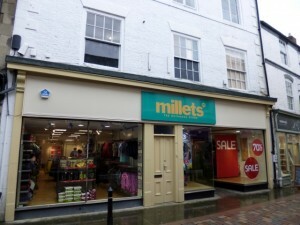 Hexham’s Millets has also been hindered by its small size and awkward layout, which is basically two small shop units knocked together, and separated by a street-accessed staircase leading to the upper floors. Indeed, the unsuitable space was why the unit’s previous occupant, Next, vacated the site in 2005. My impression is that Next would have remained in Hexham had there been appropriate premises available elsewhere at the time, but the chain seems likely to finally return after its application to lift a furniture-only planning restriction on Tynedale House – the long-empty unit adjacent to Tesco – was approved on 8 August (12/01728/VARYCO). It’s a sign of Hexham’s continued strength and popularity as a retail centre that it’s taken Next seven years to find a new site. As for the soon-to-be-ex-Millets, a coffee shop seems the most likely new occupant – and one that would, to be fair, make sensible use of a difficult space. Though the Courant had Starbucks denying rumours that it was set to open there, we know that an application for the unit’s change of use from A1 (shops) to A3 (restaurants and cafés) was submitted in March and approved last month (12/00911/FUL). If it isn’t Starbucks, it surely wouldn’t be a surprise if the rapidly expanding Costa Coffee were to have Hexham in its sights. My retail consultancy business, CannyInsights.com, provides bespoke place- and sector-specific market intelligence, including coverage of both Northumberland and the outdoor leisure sector. It also works with retailers nationwide to improve their stores, customer communications and market knowledge. For more information, visit www.cannyinsights.com, drop me an email, or give me a call on (0191) 461 0361.